A mix of interesting party food is certain to help make your party a smashing success. Party food can be everything from finger foods and sandwiches to a lavish formal meal. The food can often be the main draw of the party, so you need to be prepared. Even if it is a simple affair, you will need to give your guests some sort of food options to enjoy. There are endless types of foods that can be served at a party. If you have adventurous friends, they may enjoy tasting food from tropical locations such as the Caribbean, Hawaii or other exotic places. If your guests are a bit more conservative, stick with basic but never boring menus. Menus that consist of meat, vegetables and potato dishes are always ideal. No matter the occasion, there is sure to be something for everyone to enjoy. Proper planning of the menu can also be simplified by getting a feel for what your guests may enjoy. At a party with lots of children, be sure to include favorite kids' party foods along with adult fare. Party food can be served in different ways depending on the type of affair you are hosting. More casual gatherings call for a buffet while formal parties may use a sit-down style dinner. Food can be presented family-style placing platters and bowls of food on the table to pass around or plated individually and brought out to each guest. 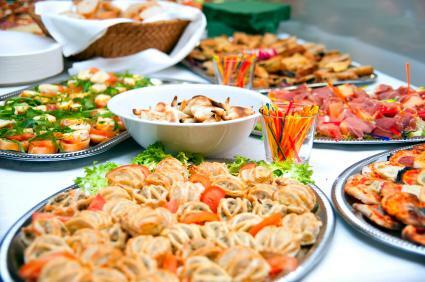 If you are hosting a cocktail party, trays of hors d'oeuvres can be passed around the party or set up in a location that can be accessible to all attending the party. Nothing can complete a party menu better than a delicious dessert or a festive cocktail. You can tailor your choices to reflect the type of party you are hosting and to your guests' individual preferences. Other special touches to include with your food are decorative serving platters and garnishes.